Purchasing a used Jet Ski or Waverunner be concerning when there is no title to transfer ownership of the vehicle. In these circumstances your best bet is a Bill of Sale which documents the transfer of ownership from the prior owner to the new owner. Most states require that a contract be in written form when the exchange of over $500 occurs (some states require all contracts while others have higher thresholds). The Bill of Sale requires certain aspects to make it effective and hold up in court if the ownership was ever contested by another party. These aspects are defined by the elements necessary to form a binding contract by law and include the Offer (the exchange of the watercraft), Consideration (the money being paid in return), Acceptance of the Offer (Signatures of both parties), and Mutual Agreement. 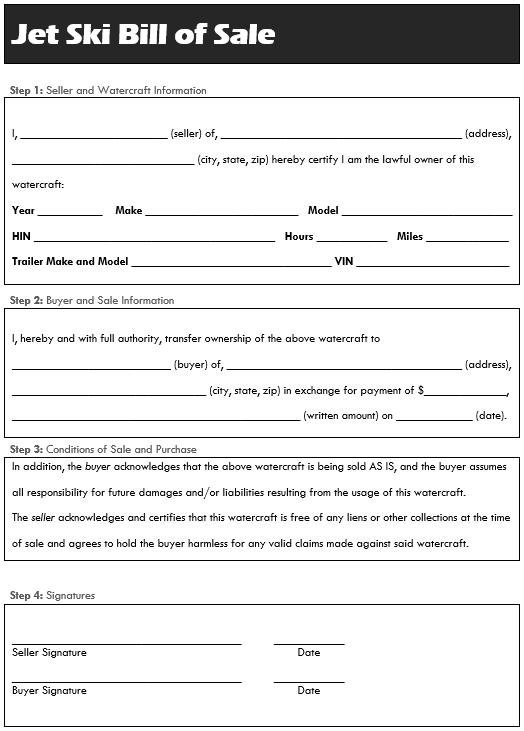 The two Bill of Sale templates below includes a provision stipulating that the watercraft is being sold As-Is and the seller will not be responsible for the future use of the watercraft. This protects the buyer from unwarranted claims. 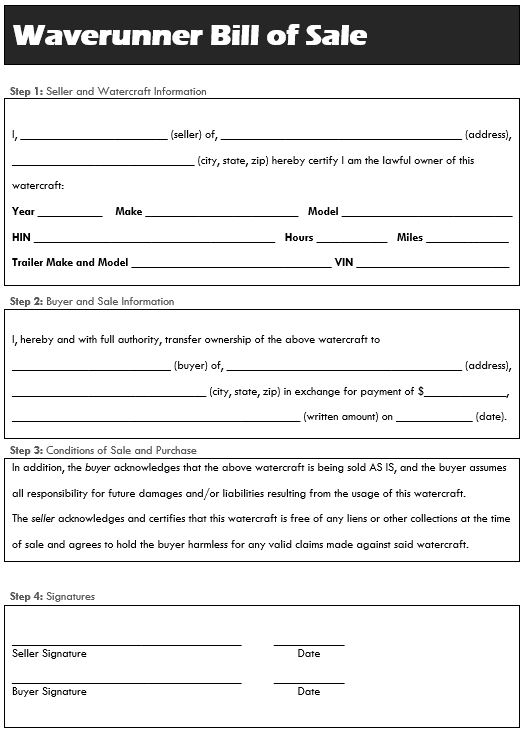 Also included is a provision that the seller has full authority to sell the watercraft and that no liens exist. This protects the buyer from future claims of ownership or lien from other parties.